It all started in the back of an ambulance. Moriel Vandsburger, then a high school student in small-town Virginia, was a volunteer for the town’s response team, training as an emergency medical technician. As the ambulance rushed to the hospital, Vandsburger would watch and work, mesmerized by medical devices that gave glimpses into the body — and how to fix it. In college, Vandsburger shadowed doctors at a local clinic but always gravitated toward the machines — how they ticked and where they failed. Vandsburger noticed that, far too often, doctors were stunted in their patient care because of the limitations of their tools. 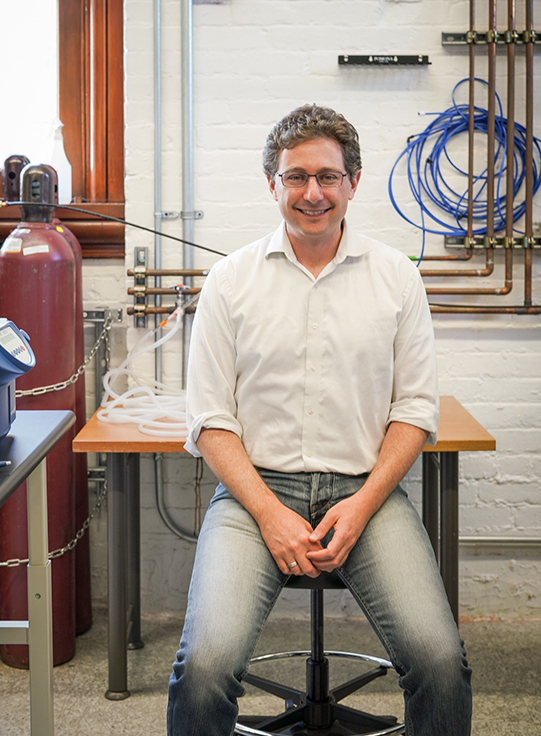 Now, as a bioengineering professor at UC Berkeley, he’s inventing new ones. For the past decade, Vandsburger has been working on technology that will open a new window into the heart. A futuristic camera of sorts, the tool could let physicians predict heart failure decades in advance and revolutionize our understanding of genetic and stem cell therapies. But people have been studying the heart for generations, Vandsburger points out, along with the slew of treatments and diseases surrounding it. So as the researcher works toward the future, his first step has been to look back. “Let me give full disclosure that I also minored in history in college, and I like reading old stuff,” Vandsburger says, grinning. For several hours each week, Vandsburger pores over academic journals provided through the Library, investigating what paths are left to explore and which wild ideas lie untested. “One thing I think is really important in science is, it’s easy to think that you have a new idea,” Vandsburger says. “But the reality is hundreds of people have probably thought about it before. Each year in the United States, about 610,000 people die of heart disease, according to the Centers for Disease Control and Prevention. It’s the No. 1 cause of death in the world. When it comes to heart disease, research and treatment has overwhelmingly concentrated on a subset called ischemic heart disease — the precursor to heart attacks, defined by fatty buildups in the arteries that deprive the heart of oxygen. 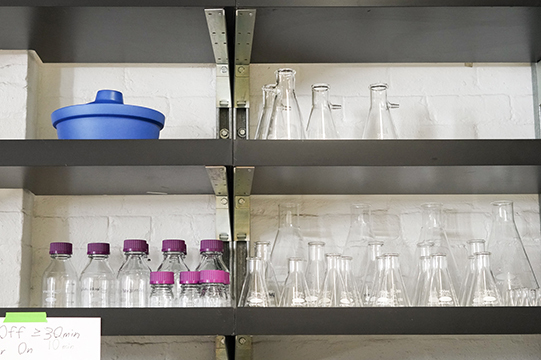 A drying rack holds flasks, beakers, and other glassware in Vandsburger's lab. Diagnosis for that group of heart disease is routine and treatments often successful. During an exam, a clinician will take images of a patient’s heart and compare the results to known patterns of disease. Once diagnosed, the problems can be treated with medication or surgery. For non-ischemic heart disease — any kind of heart disease not related to clogged arteries — it’s a different story. There are no simple metrics and no direct therapies. Causes can range from obesity and alcoholism to autoimmune disease and kidney failure. What is clear, Vandsburger explains, is that, in most cases, the connective tissue of the heart will harden, leaving a trail of scarlike tissue, called fibrosis, around the heart’s chambers. That scar tissue strains the cells that pump the heart. In response, cells secrete stress signals that reverberate throughout the body. For a long time, that was impossible. There haven’t been effective therapies, he says, because we haven’t had the tools to understand those pathways. That’s where Vandsburger’s lab comes in. The lab is developing magnetic resonance imaging, or MRI, technology that can safely visualize the heart on the molecular level, showing the microscopic beginnings of heart disease. The images show not only how much fibrosis has built up, but also the pH (acidity level) of the heart tissue (another marker of disease) and, crucially, how much energy the heart wastes trying to pump. In 2015, about 15.5 million people in the country visited a physician for non-ischemic heart disease, according to the CDC. The condition is responsible for about one-fifth of all sudden cardiac deaths, studies report. People usually visit a doctor only when they notice the symptoms — shortness of breath, fatigue, and body swelling, to name a few. By the time that happens, though, the heart has already begun to deteriorate. Heart disease takes root at the body’s genetic and cellular levels. Symptoms appear as it spreads throughout the tissue, and the disease becomes critical once it takes over the organ, mutating size and movement. Current MRI scans only pick up the final stage. One early sign of heart disease is how much energy the heart must spend trying to pump. Using the new molecular MRI technology, the researchers can measure the heart’s metabolic function — how it cycles energy — by actually counting in their scans the cellular waste products of those processes. In one study of obese adults, Vandsburger’s team found that their hearts’ metabolic function was drastically low, even though heart size and movement — what a cardiologist typically measures with an MRI — were completely normal. The research has lifesaving implications for people with kidney failure — a disease intricately tied to heart failure. Healthy kidneys filter water and waste from our blood; when they fail, waste builds up, raising the body’s blood pressure. That pressure overworks the heart until it eventually collapses. On the left is a standard MRI image of a 42-year-old dialysis patient’s heart. 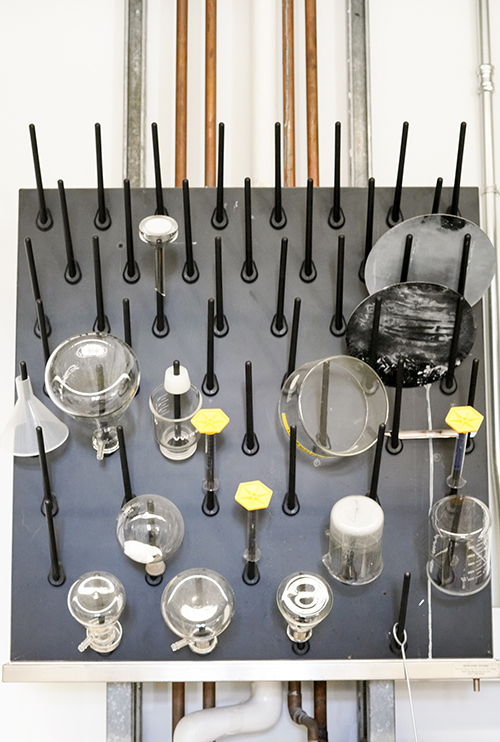 At center and right are images taken with the lab’s new technology. The scan on the right was taken one year after the scan in the center. scarlike tissue (depicted in white, yellow, and red, from most to least dense). Using the new tool, Vandsburger’s team can actually monitor that breakdown. The lab recently imaged the heart of a 42-year-old dialysis patient. In the first set of scans, there was barely any damaged tissue. Just one year later, however, dense scar tissue had completely filled the space between the heart’s lower chambers. According to Vandsburger, information from their scans could make it clear to physicians just how rapidly a disease is progressing and allow them to swiftly identify patients who need devices such as a pacemaker. “This is the data we want to start getting to clinicians,” he says. 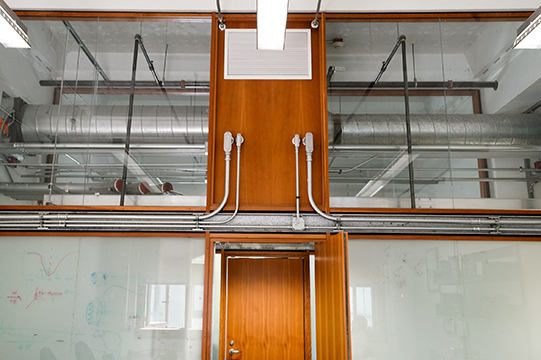 The dream is that the lab’s research will someday inform standard diagnostic tests, and even routine checkups, so people who might be at risk can take steps to prevent disease before it ever comes to the door. The wider diagnostic windows could also revolutionize stem cell and gene therapies. Gene therapies target the body’s DNA, directing cells to express new, restorative genes. But they’re currently administered only at the late stage of disease, and studied only in terms of whether the whole organ changes — not the most helpful data for scientists. With the new technology, researchers could not only offer therapies sooner, but actually study how they interact with the body’s cells over time. By quantifying the effects of gene transfer on heart cells, researchers could drive the development of new treatments. 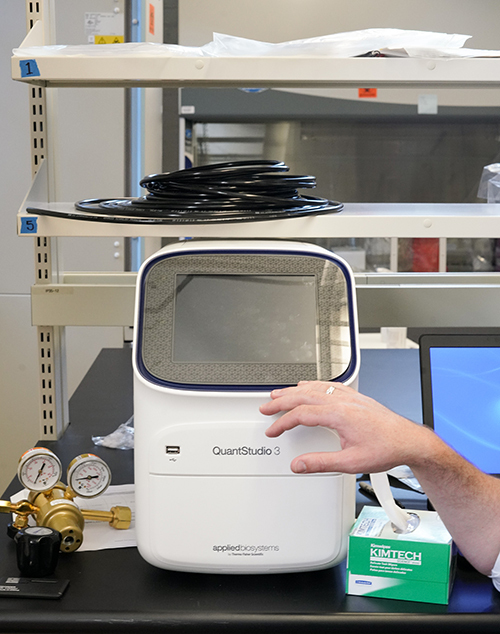 Vandsburger points out the lab's RT-PCR device, which helps them get a closer look at RNA. According to Conolly, the bioengineering professor, the technology could, someday, reach even further — into the abyss of neurodegenerative diseases. As Conolly explains, diagnosing Alzheimer’s and Parkinson's disease always comes down to a judgment call — it’s “much more analog than digital,” he says. Current imaging methods are rarely definitive, with clinical symptoms often proving more helpful than scans. “Moriel’s not working in that space yet, but I’m certain he’s curious about it,” says Conolly, who studied MRI technology for 25 years. For Vandsburger, it’s clear the technology has implications for fields outside his own. And so, each week, Vandsburger carves out time to read the mountain of research surrounding him — what he calls the “scientific landscape.” He dives into topics ranging from diabetes and heart disease to imaging technology and pharmaceutical biochemistry. When he stumbles on a good journal, Vandsburger locates it on OskiCat, the Library’s online catalog. Then he’ll search for older articles within the journal to study how a particular perspective has evolved over time. For Vandsburger, Library resources have been a springboard for unbounded creativity, allowing him to follow inspiration to no end. “It is the most important resource — being able to say, I don’t understand this, but I’m curious about it, and here’s all the information I need conveniently provided to me,” he says. “Every good idea doesn’t necessarily come from background knowledge,” he continues. “It comes from hearing something interesting … and then being able to go out and access all this information and realize how you can pivot that research in a new direction and bring 20 years of knowledge in one area into a new one. Mini-spatula? Book knife? Here’s an inside look at Library tools.